The Impala's transmission has changed its mind about being a transmission. The S-10 was built when Bush was elected. No, not that one. His father. 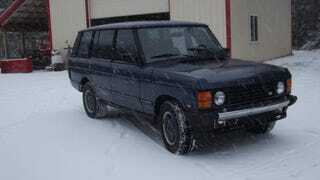 I need a new vehicle, and this 1993 Range Rover has caught my eye. All you'll really find on the U.P. Craigslist are clapped-out trucks and beat-to-hell "Cameros," but this rare gem has been listed for a few months now. Problem is, all I really know about Range Rovers comes from the Top Gear Bolivia Special, and I fear the prospect of owning one of their featured vehicles is letting me see this thing through rose colored glasses. The ad says, "Fuel Injected 4.2L V8 Runs great with no cooling issues." This isn't the rain forest; this is the Upper Peninsula. Are these Rover motors that prone to overheating? What does "Changed the hub fluid with Lucas" mean? I mean... really, hub fluid? Check out the listing, and let me know what you guys think. An interesting vehicle to stand out among the sea of F-150s and Trailblazers here, or a hellish money pit that has been for sale this long for a good reason?